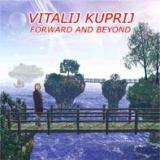 Vitalij Kuprij is a man who should need no introduction to any fans of keyboards and progressive metal out there. To those who don’t know his work, I would say that this Ukraine-born shredder-maestro is a veritable Yngwie of the keyboards. He is the keyboard player of Artension and Ring Of Fire, and has played as a guest-session player on numerous solo albums, from Greg Howe to James Murphy (ex-Death) to name some. He has also released three studio albums and Forward And Beyond is his fourth offering. This album mixes many styles together, from progressive metal with all the regular time change-noodling and light-of-speed –solos to traditional chunking heavy metal to flat out classical music on the piano and slower, mood-calming pieces. This album features many guest guitarists, from Symphony Xs Michael Romeo to one of the most over-the-top guitar shredders on the planet, Fransesco Fareri. So the guitar work does not pale in comparison to the keys, at least not in the technical standpoint. The drums sound like programmed drum machines (correct me if you know otherwise), especially because of the production that leaves the drums a bit thin and buried in the mix. But lets remember that the drums are not the star of the show here. All songs are instrumental and to anyone who is a fan of such music, this album is a goldmine. Illusion is a very beautiful, more textural feel-good song that I would very likely use in the background when wanting to relax after a hard days work. Far From Home brings out a real spirit of Trilogy-era Yngwie, very well executed neo-classical metal with several parts, ranging from heavy, chugging riffs and blazing leads to slow acoustic pieces. Idol Tribute, Variations In D Minor and Piano Overture are all songs that show Vitaljs passion for classical music. He gives out his own interpretations of many famous classical composers, from Beethoven to Chopin and from Mozart to Bach, just to name a few. But his own songs are the real stars on the album. Vitalij is truly both a very talented composer and a technical genius. Trying to play along with this album would just about equal climbing Mount Everest or K2, I would say. Either on guitar or on the keys, just make a pick. If instrumental wizardry in the vein of Warmen and say, Liquid Tension Experiment is not in your preferences, then this might not be the best album for you. I still recommend that this album is given a shot, as the compositions are much stronger than on the majority of these “solo-albums-by-shredder-composer-X”-offerings. On the other hand, if you very much enjoy highly technical instrumental music with very beautiful textural parts in the mix, I highly advice you to find out about Vitalij Kuprij and his music. My quote on this album should be taken on a basis of your preference with instrumental music. If you do not like it, deduct about 20 points from the quote. If you do like it, add about 20 more. A very diverse album by a very gifted musician.